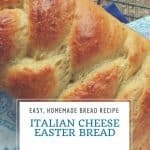 This easy recipe for homemade Italian Easter Cheese Bread is worthy of a special occasion. A rich dough yields a memorable braided bread. Homemade Italian Easter Cheese Bread deserves to be made more often then once a year. 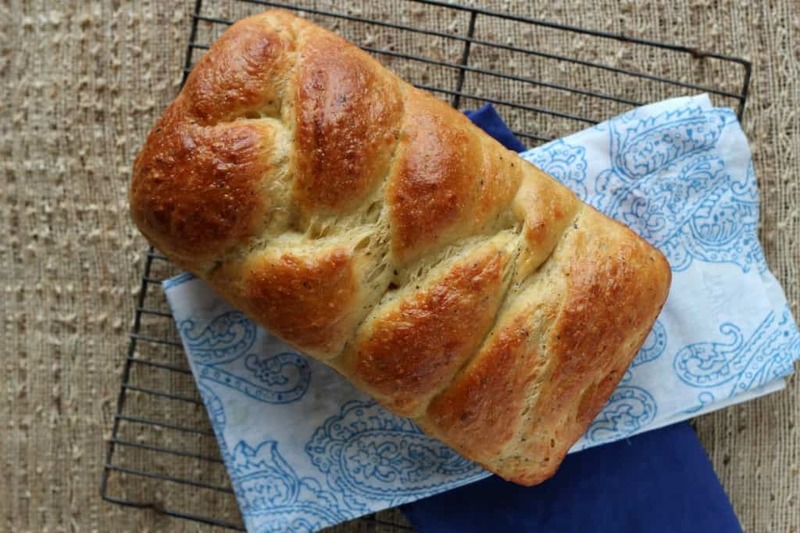 This easy bread recipe yields a beautiful braided loaf of bread. Braiding the bread dough is so much easier than you might first think! Baking yeast bread recipes is not complicated. This yeast dough gains structure from eggs similar to a brioche dough. It is really an easy dough to handle. 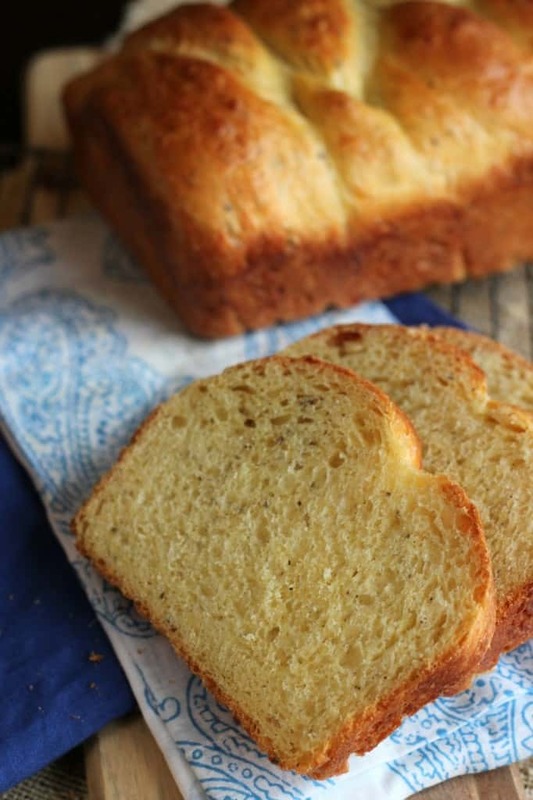 The dough isn’t too sticky and this bread recipe is a good one for beginner bread bakers. Our theme with #Breadbakers for April is Breads from Italy and this list of recipes might make you wish you were traveling through the Italian countryside, sampling breads and wine as you go. 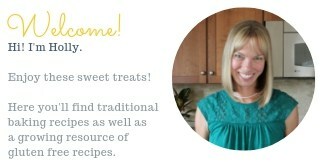 In fact, if this virtual baking group ever plans to meet up, may I be the first to suggest we do so on a food adventure? Yes, Italy would suit me just fine! Thank you to Ansh, the creator of Spiceroots, for hosting this month. What is Italian Cheese Bread? 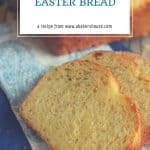 This authentic Italian Easter Bread recipe is from King Arthur Flour for Italian Easter Cheese Bread, also known as Crescia al Formaggio. This braided bread gains its golden hue from eggs and the easy-to-work-with (but slightly sticky) dough is accented with Parmesan cheese and a healthy dose of pepper. Other cheeses that work well in cheese bread include Pecorino Romano and Gruyere. 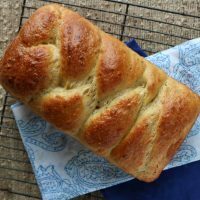 Also known as Italian pepper bread, this bread recipe is on the savory side; at my house it will be a treat to use for sandwiches made with Easter’s leftover ham. Another option where this Italian bread would sing is in a ham and cheese bread pudding, also a good way to make leftovers brand new. Do you have leftover Parmesan? Try bread recipes such as Parmesan Thyme Crackers, Cheese and Garlic Biscuits, or Cheese and Chive Scones. What makes this bread an Easter Bread? This Parmesan cheese bread is often made for Easter in Italy, although it can be found year round at bakeries. Some Easter breads are shaped into circles with eggs nestled in the middle; others are shaped in the image of doves. (How does that work? Sounds challenging to me!) You could do either with this egg-based dough. For this Easter bread I did a simple braid with three logs of the dough then baked it in a bread pan. Sometimes it is thought that the three braids signify the Christian holy trinity. Other traditional Easter breads include Hot Cross Buns which are popular in England, although I first came across the tradition of hot cross buns when we lived in Bermuda. Easter cookies are always welcome at my family’s table. These cross cookies and these Easter basket cookies are a lovely addition to your Easter dessert! How do you braid bread? Braiding bread dough is easier than you think. Simply divide the dough into three equal strands. Try to make the strands about the same width and length, as best you can. Lay the strands on parchment paper, laying the ends on top of each other at the top. Then braid away! Tuck the ends under and gently place your braided dough into your prepared loaf pan. This video from King Arthur Flour gives a visual how-to which makes bread braiding easy to picture. I find the King Arthur Flour provides reliable and repeatable recipes that I come to count on in my kitchen. There is a great satisfaction in baking bread at home and to start with recipes that I know will yield good results is really important to me. I think you’ll agree if you give this recipe a try. Italian Cheese Bread is an egg rich yeast dough traditionally made at Easter. 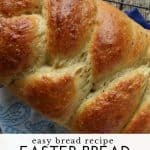 Try this easy bread recipe any time of year! Use a stand mixer with a bread hook. Put all of the ingredients EXCEPT the cheese into the mixer bowl. First mix the ingredients together with a wooden spoon then use the bread hook to knead for about 15 minutes. The dough will be sticky. Slowly add the cheese and continue to blend with the dough hook. Spray a glass bowl with baking spray. Form a ball of dough and place it in the sprayed bowl. Turn the ball of dough a few times so that all sides are covered. Then spray a sheet of plastic wrap with baking spray and place on top of the bowl. Let the dough rise for one hour. Punch down the dough a few times, folding the sides into the middle. Let the dough rest for an additional hour. Divide the dough into three strands and braid, tucking the ends under as you place the braided dough into a greased loaf pan. Use the sprayed plastic wrap and cover the dough pan. The dough will need to rise for about 2 hours or until it is nearly double in height. Make an egg wash by whisking together the egg white and a small bit of water. Brush this on top of your bread. 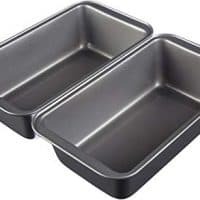 Bake the bread for 15 minutes at 425 degrees, then reduce the oven temp to 350 degrees F. If the top has browned already, use a piece of aluminum foil to cover the top of the bread. Bake for 30 more minutes. Remove from the oven and let the bread sit in the pan for 5-10 minutes before placing it on a wire cooling rack. If you knock on the bottom of the bread it should sound hollow. If not, bake the bread for another 15 minutes. The original recipe is from King Arthur Flour. 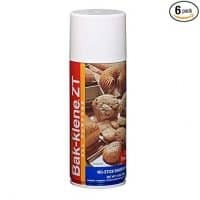 Bak Klene ZT All Purpose Release Aerosol Spray, 14 Ounce - 6 per case. Post originally published in April 2017. Updated in 2019. Beautiful Bake, Holly. And Italy works for me too. What a fun adventure it would be to travel with you all. Thank you for participating this month. I’d say you definitely succeeded making this one! It looks delicious and Cheese? Yes please! 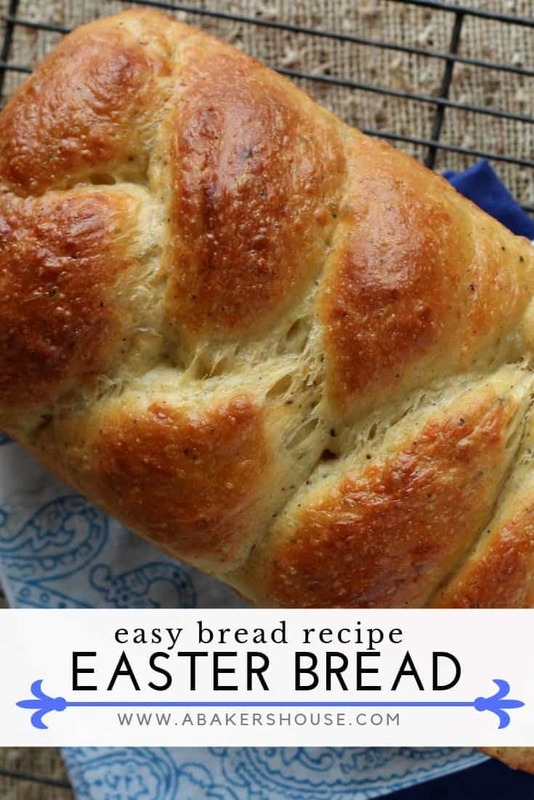 An Easter cheese bread sounds amazing! Gorgeous! The color is so rich and I can just imagine how good it tastes. Cheesy bread is never, ever a bad thing. I have actually made this one, and it IS delicious. Yours is gorgeous! I actually had an Italian tourism blogger steal my post and pass it on as their own! This bread is wonderful with antipasti! Gorgeous braiding! That is a beautiful loaf!!!! That is an absolutely delicious looking cheese bread. Soooo yummy! !